The Dhanuks, who are settled in the Terai districts of Saptari, Siraha and Dhanusa, are either Dalits or a minority indigenous people. Dhanuks are called Rajbanshis. The Dhanuks of Eastern Terai are called Kurmi and Patel in the Western Terai. 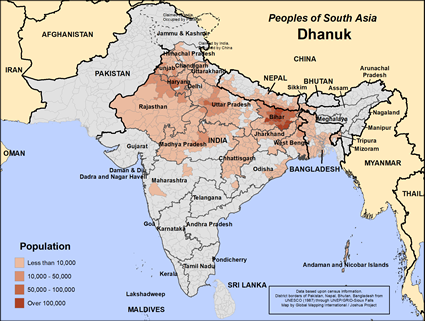 The Dhanuks live all across India, Nepal, Bangladesh and Pakistan. Dhanuks are scattered from Morang in the east to the Terai in the west. But the Dhanuk are also found in Saptari, Siraha and Dhanusa in the east. Their main area of settlement stretches from Saptari to Dhanusa in the inner valley plain south of the Churia Hills. It is hard to calculate the population of minority nationality of Dhanuks in Nepal. Their language and culture of the Dhanuks are similar to the Tharus. The Dhanuks, like Tharus, are employed by landlords and well-to-do persons to do private household work. They also look very much like Tharus. They are influenced by the Hindu religion and the Indian culture across the border. The language of the Dhanuks is Maithili and Hindi in eastern Terai. The rites of birth, death and marriage are performed by giving due importance like other tribes. The pregnant woman is kept in a separate home to arrange assistance from a dagrin (midwife) of the Chamar community. The baby is caused to cry as soon as it is born. "Ghosts" are driven away by putting the branches of jujube and unwanted shoes placed at the main gate of the house. The baby is given the milk of a she-goat to drink. Chhaiti is done in six days and Barahi in twelve days. In Barahi, worship and festivities are arranged. Dhanuks do not marry within the clan nor do they have the practice of cross-cousin marriage. In most of the cases, the parents seek the girl or the boy. Due to the influence of neighbors they also have the system of dowry. When a Dhanuk dies, the corpse is cremated if the deceased is above 12 years of age and is buried if younger. The houses of Dhanuks are plastered with mud and pictures are drawn of mud too. Women go outside for work but a male member remains the head of the family. Lots of feasts are organized on various occasions. Some Dhanuks never drink spirits and jaand but Dhanuks in general have the practice of drinking raksi or spirits. The houses of Dhanuks are built in cluster in the river basins and edges of forests. They like to settle in river basins. A group of ten or eleven households makes a bindar committee and five bindars constitute a praganna. The chief of praganna is called maijan. There is one post, called Chaurasi, above him. These institutions manage tribal reconciliation and settlement of disputes. Those who do not abide by rules are expelled from the ethnic group. Mandal, Mahato and Kurmi are their thars (clans). Since they dwell in the river basins and the edges of forests, they do fishing and animal husbandry. Some people of various types within the Dhanuks are even big landowners, but the Dhanuks who belong to the group of minority nationality are absolutely landless. They earn their livelihood by working as agriculture laborers and household servants. In some places Brahmins are appointed as priests while in other places they use Dhanuk priests. Dhanuks believe in magic, witchcraft and ghosts. They are divided into two groups in terms of religion: those who worship Kali are called Kaliyaha and others are called Maharkhiya. Those who worship Kali eat pork and drink alcohol, whereas Maharkhiyas do not do so. They worship a goddess called Gahil, who is one of five sisters. Their other goddesses are Shitalmata and Goureya Gaiya. The main occupation of Dhanuks is working for big zamindars (landowners) and farming. Today there are several churches and quite a few believers among them. View Dhanuk in all countries.